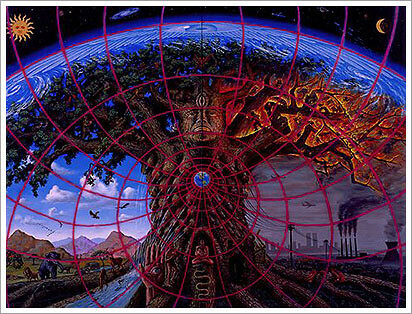 Here is a nice video clip with Alex Grey talking a little about his seminal art works depicting mans spiritual potential. He refers to his works as visionary and himself as a mystic. When you see his painting ‘Gaia’, from 1989 complete with two air liners, twin towers, Bush and ‘terrorist’ look-a-like you’ll understand that Alex can see to the truth of things.